A couple of weeks ago I was excited to tell you about The 2nd Annual Low-Carb Cruise coming up January 19-24, 2009 leaving out of Galveston, Texas on the luxurious Carnival Ecstasy ship. A group of 35 of us had a fabulous time in February this year on this exact same cruise down to Cozumel and Progreso, Mexico and it was simply amazing. We met so many people and built lasting friendships with people who are passionate about the healthy low-carb lifestyle. That's why we wanna go back again in 2009. Just in case you are wondering, yes, you CAN eat low-carb on a cruise with a little guidance and we'll have three amazing low-carb experts on board to help provide that direction for you while you enjoy some fun in the sun on your low-carb vacation getaway. That's right, there will not one, not two, but THREE BIG LOW-CARB EXPERTS on board the ship providing seminars and one-on-one sessions with the people who attend. WOO HOO! DR. JONNY BOWDEN, PhD, C.N.S. He is the author of the must-have book for anyone going on a low-carb diet entitled Living The Low-Carb Life where each of the major low-carb plans are evaluated and compared so that you can choose the one that's right for YOU! Jonny's most recent books on Fair Winds Press have been very popular as well, including 150 Healthiest Foods On Earth, The Most Effective Natural Cures On Earth, and his upcoming release in June 2008 The Healthiest Meals On Earth, a cookbook featuring the healthy foods he wrote about in his first two books. This man is an incredible speaker and motivator on the subject of diet, health and weight loss as you will find out very quickly and will be a welcomed voice on this low-carb cruise. DR. ERIC WESTMAN, MD, M.H.S. As one of the world's leading researchers on carbohydrate-restricted diets, Dr. Westman has taken the knowledge he has observed in his study participants and is now applying what he has learned to his own patients who come to see him at his Durham, NC-based Duke Lifestyle Medicine Clinic with such serious health issues as obesity, diabetes, and worse. He is in my estimation one of the kindest men I have ever met in my life and is so very accessible with his time treating his patients like human beings rather than a statistic hurrying them through his office like some number. You'll immediately notice exactly what I'm talking about from the time you meet Dr. Westman and I'm thrilled to have him joining us on this cruise down to Mexico. The late great Dr. Robert C. Atkins was fortunate to have a nurse like Jackie Eberstein by his side for three decades as he treated patients with his world-famous low-carb nutritional approach. She really knows all the ins and outs of this way of eating so well that I consider her the foremost authority on the Atkins diet today. She was the co-author of the book Atkins Diabetes Revolution (with Dr. Mary C. Vernon) and has frequently defended the healthy low-carb lifestyle in columns and articles in the medical media. Anytime I have a question from a reader that leaves me stumped, Jackie is always there to provide her unique perspective and it is such an honor to have her join us on this special get-together on the Carnival Ecstasy. Isn't this AWESOME?! And who knows, there may be even more low-carb experts who will be hopping on board this cruise coming up in January 2009, so what are you waiting for (you never know)? GO SIGN UP right now so you won't miss out on all the fun and excitement we're gonna have. Christine and I will be there as will Amy from "Eating Low," Christin from "The Journey On," Amy Dungan (Sparky's Girl) from "Healthy Low-Carb Living," and so many more. I think the best part about this year's cruise was all the NEW people I'd never met before. And most of them will be coming back again in 2009. The original deadline for having the first $50 deposit per person was May 6th, but we have been granted a slight extension for those who have not yet signed up. If you sign up by next Wednesday, May 21, 2008, then you will still only be required to put down a $50 deposit per person or $100 a room (after May 21st, the first and second deposit will be due of $200 per person or $400 a room). If you get your first deposit in on time, then your second deposit of $150 isn't due until September 8, 2008 and then the remaining balance is due on November 6th. 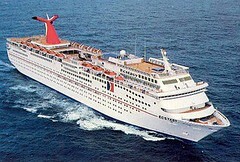 The total cost of this cruise is a very affordable $400 each which includes all your port charges and taxes. And the man who organized our cruise for us this year gave us a room credit of $75 that we could spend on anything we wanted on the ship. That was COOL and very unexpected! I've been getting many e-mails from people telling me they REALLY want to go on the cruise, but they didn't know how to sign up. Here's how: it should be booked through Vacations To Go through our cruise agent Amelie Richards and you can contact her directly with any questions about the 2nd Annual Low-Carb Cruise by calling her toll-free 800-514-9986 ext. 7583 anytime Monday through Friday from 8am-5pm CST. Or you can e-mail her Amelie at arichards@vacationstogo.com. If you have any questions for our cruise leader, her name is Becky Regandy and she can be reached at xregandyx@yahoo.com. I appreciate all the hard work she put into this year's cruise and she's doing a superb job again for the one in 2009. This will be THE low-carb event of 2009, so book your reservations NOW! Don't know if I ever mentioned this, but before taking time off to produce "FAT HEAD" I was a cruise-ship comedian. Perhaps my agent should work something out with Carnival ... ? It would be nice to finally meet you in person. As for your numbers, OUTSTANDING! Your HDL/triglycerides ratio is one to one and that's fabulous! Just wait until I blog about my cholesterol numbers soon. It would make your doctor flip his lid. I can't wait to blog about it. Yeah, I hate that for you Alycin! When we get this thing going a little bit, then maybe we can move the dates around for students and other people who can't get away in January or February. THANKS for writing!